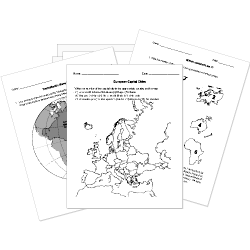 You can create printable tests and worksheets from these Grade 7 African Geography questions! Select one or more questions using the checkboxes above each question. Then click the add selected questions to a test button before moving to another page. What is largest lake in Africa? Clearing land for cultivation can sometimes contribute to desertification. What is the name of the desert that stretches across most of North Africa? In which country does the White Nile originate? Temperatures in the Sahara can reach as high as how many degrees Fahrenheit? The White Nile and Blue Nile meet where in Sudan? In which country does the Blue Nile originate? In the middle of the Sahara. What direction would a trader be going if they were traveling from Egypt to Ethiopia? In which region of Africa would you find large animals that eat grass? The Kalahari Desert is located in Africa. How many square miles is it? What are two of the four modern day countries that made up the Barbary Coast?